It’s the first day of winter today. After a warm weekend the cooler weather finally seems to have settled. The skies are overcast and there is a cold wind blowing. I pulled out the warm baby doona from the cupboard for little T and have all the windows closed even though it is the middle of the day. I’m drinking a pot of tea as I write this, S’s big woolen socks on my feet. Winter brings with it a strange sense of melancholic satisfaction, at once the desire to stay still and go internal, and at the same time to escape to far-flung places. I’m in the mood for watching movies, going to bed early, drinking red wine, listening to jazz, writing stories. And eating all things roasted. Growing up we lived around the corner from an amazing Lebanese restaurant called Almazett. It’s a great restaurant and somewhat of an institution – big wooden tables, faded royal-red carpet, and if you go on a weekend evening, belly dancers! 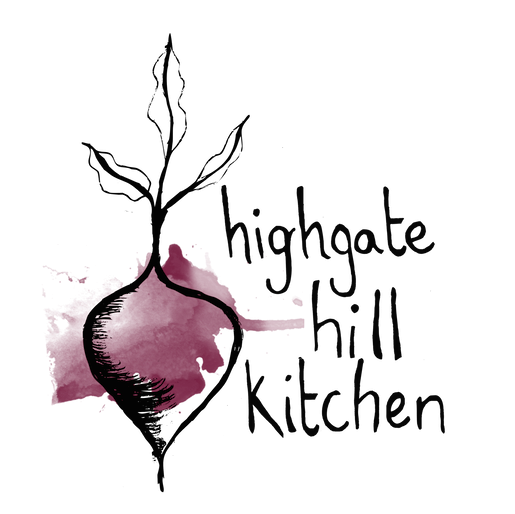 We used to eat there (or get take away from there) so often that we came to know the owners well. In all my years of eating Middle Eastern and Lebanese food, this place still ranks at the top of my list (given I’ve never actually been to Lebanon). The food is always fresh, never oily, and full of spice and flavour. And their hummus is the bomb. The flavours of this pilaf remind of me the rice we used to get at Almazett. The restaurant version had minced meat and pine nuts in it, whereas mine is a veganised version, complete with fresh herbs. 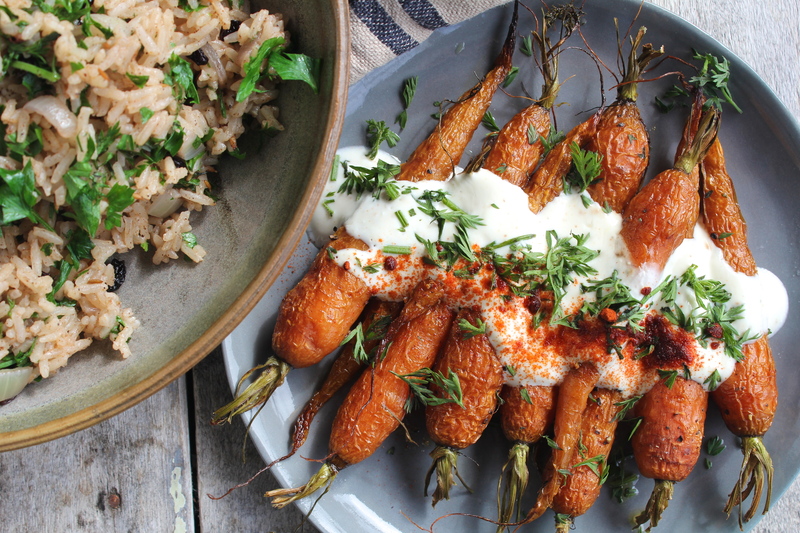 I served it with these wonderful roasted carrots (if you’re vegan, switch the yoghurt sauce for a tahini one), but you could also serve it up with some green beans & asparagus, roasted chickpeas and carrot salad, some freshly baked fish (if you swing that way), or just a mess of roasted veges. A simple pilaf like this one is really easy to make but transforms plain white rice into something else entirely. We rarely eat white rice, preferring the brown variety or different kinds of wholegrains (quinoa, millet, buckwheat), but every now and then I feel like coconut rice, or this pilaf. 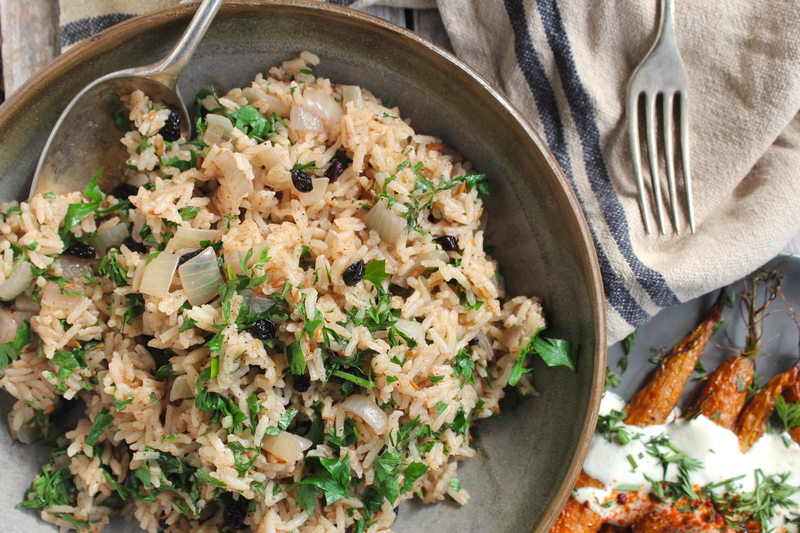 The spices pack a punch, the herbs bring the freshness, and the currants bring a hint of sweet. 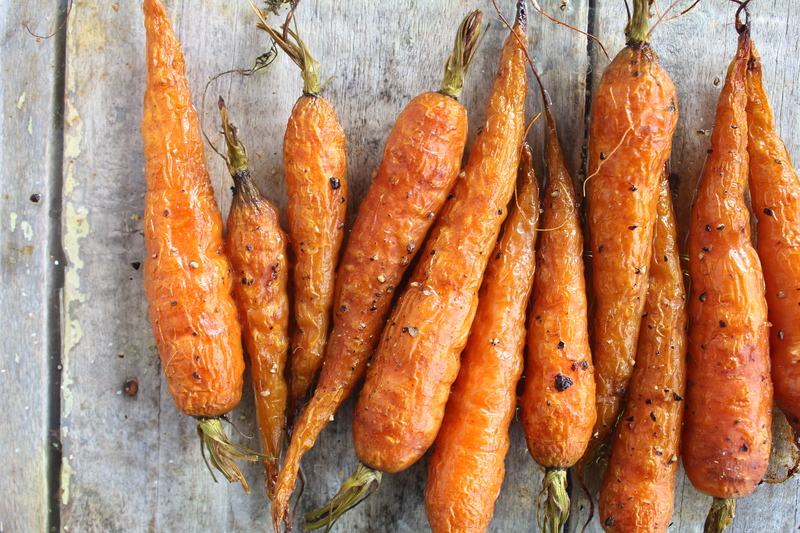 And who doesn’t love baby carrots roasted to the point of caramelisation?! Using a fine colander rinse the rice under cold running water and set aside. Dice the onion. In a saucepan heat a splash of olive oil over a medium heat. Add the onion and cook until it starts to soften, approx. 5 – 6 minutes. Add the dried spices, a pinch of salt & pepper, and the rice. Stir until the rice is well coated in the oil and spices. Add the water and bring to the boil, then turn down to a simmer, cover, and cook until the water is completely absorbed (approx. 15 minutes). Remove from the heat and leave, covered, for a further 5 minutes. In the meantime finely chop the fresh herbs. 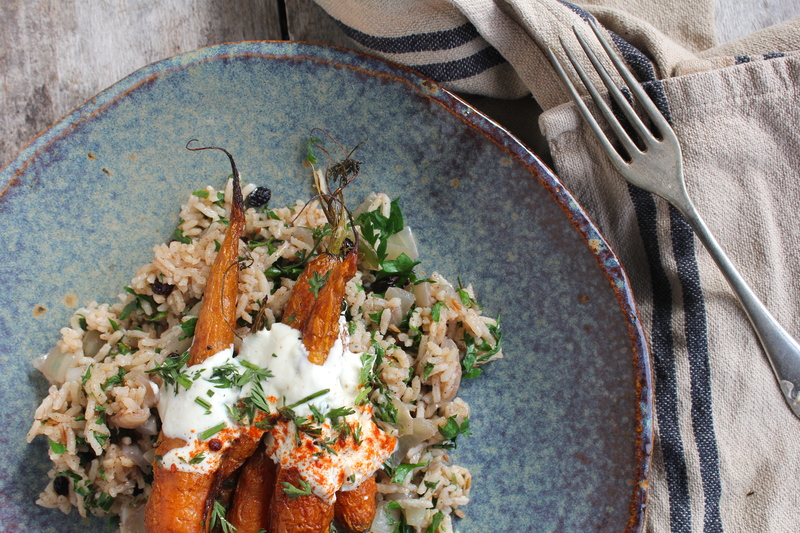 When the rice is ready to eat fluff with a fork, stir through the currants and fresh herbs, and serve, topped with Roasted Carrots with Spicy Yoghurt. Wash carrots and trim any attached stalks/greens. Place in a single layer on a baking dish and drizzle with olive oil, using your hands to turn the carrots and make sure they are coated in the oil. Sprinkle with a pinch of salt & pepper and bake for approx. 35 – 40 minutes, until they start to caramelise. In the meantime prepare the spicy yoghurt sauce by whisking together the yoghurt, cayenne pepper, and a pinch of salt. Set aside. 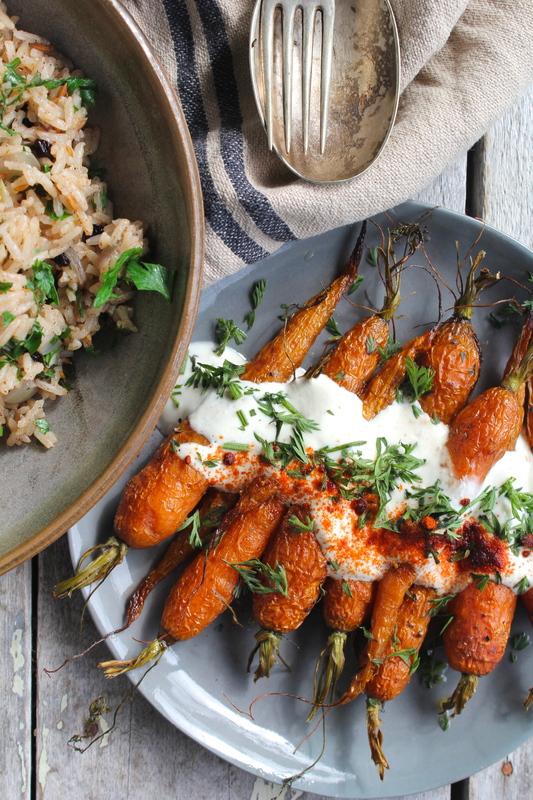 When the carrots are ready drizzle with the yoghurt sauce and top with the paprika and fresh herbs. 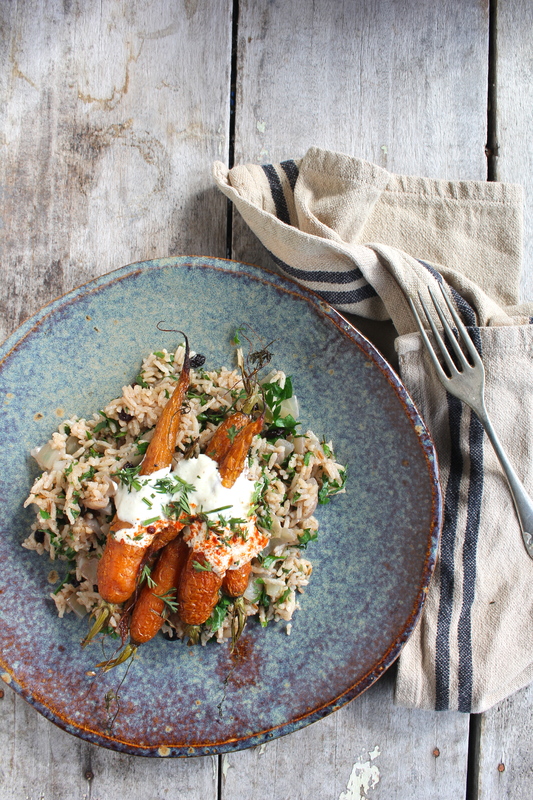 Eat while hot, on top of bowls of Simple Spiced Pilaf. 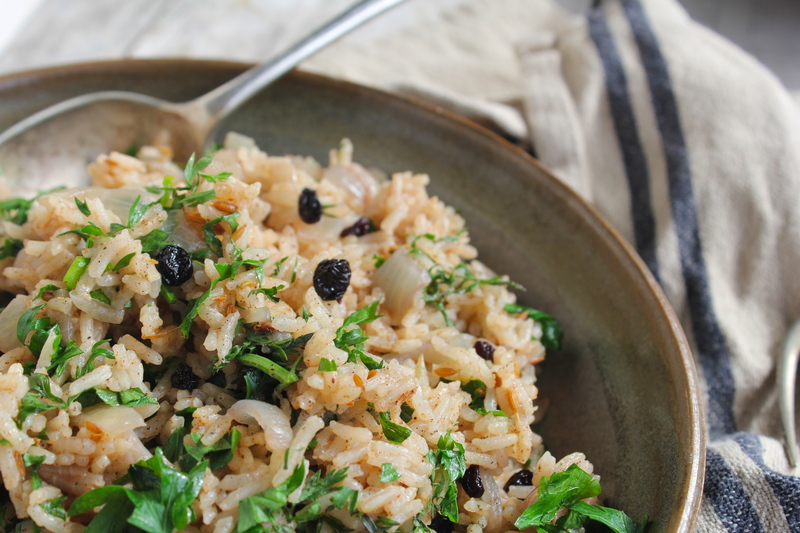 Love rice pilafs, especially with Middle Eastern flavors, but rarely make them for some odd reason. Always enjoy the pop of sweetness currants add though, and I’m swooning over that spice combo and the whole roasted carrots. 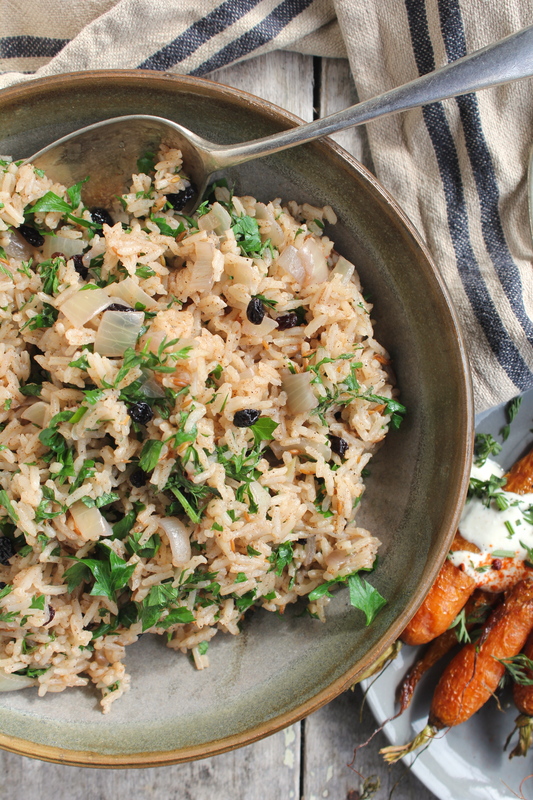 I made this pilaf to go with a coconut curry carrot soup, and it was delicious. Loved the sweet and spiced fragrance especially!